The internationally acclaimed pianist Rohan De Silva is renowned for his partnerships with violin virtuosos Itzhak Perlman, Joshua Bell, Gil Shaham, and Nadja Salerno-Sonnenberg among others. He performs frequently with Itzhak Perlman nationally and internationally, most recently during the 2006-07 season in a series of recitals across the United States. 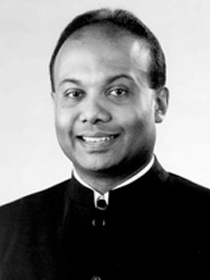 A native of Sri Lanka, he began his piano studies with his mother, the late Primrose De Silva and with the late Mary Billimoria. After six years at the Royal Academy of Music in London, he entered The Juilliard School, where he received both his Bachelor and Master of Music degrees, studying piano with Martin Canin, chamber music with Felix Galimir, and working closely with violin pedagogue Dorothy DeLay. He has been awarded numerous prizes and scholarships including a special prize as Best Accompanist at the 1990 Ninth International Tchaikovsky Competition in Moscow and the Samuel Sanders Collaborative Artist Award presented to him by Itzhak Perlman at the 2005 Classical Recording Foundation Awards Ceremony at Carnegie Hall. Mr. De Silva is currently a faculty member at the Perlman Music Program on Long Island, The Juilliard School and the Ishikawa Music Academy in Japan. He has recorded for Deutsche Grammophon, CBS/SONY Classical, Collins Classics in London, and RCA Victor.